We are very excited to have Dr. Timothy H. Chung joining us as the moderator for Drone Swarms: The Buzz of the Future. 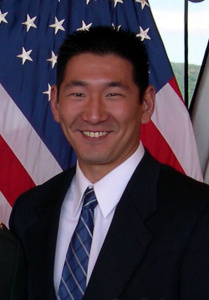 Chung is an assistant professor of systems engineering at the Naval Postgraduate School (NPS) in Monterey, California. As the deputy director of the Consortium for Robotics and Unmanned Systems Education and Research (CRUSER), Chung has executed successful tests of expanding drone swarms. Chung’s research includes probabilistic search optimization, degrees of autonomy for robotic systems, and multi-agent coordination for information gathering applications. His work brings together robotics and operations, which has led him to pioneer the development of drone swarms. Chung has been working with graduate students in the Advanced Robotic Systems Engineering Laboratory (ARSENL) at NPS. ARSENL provides an academic and research environment that supports a multidisciplinary approach to the design and development of unmanned robotic systems. Chung’s team has been pushing the boundaries of innovation in robotics technology and operations. Recently the team made news for successfully flying 50 drones controlled by a single operator, the largest drone swarm flown to date. As the drone swarm event moderator, Dr. Chung will be giving presenting an overview of drone swarms and the development of robotic technology. Be sure to join us at Stanford’s Cemex Auditorium October 15 at Drone Swarms: The Buzz of the Future. VLAB produces monthly events to highlight technological disruptions happening in many industries. We are an all-volunteeer organization and need people like you! Join us at one of our monthly pitch and planning meeting held the first Tuesday of the month at 7:00pm at WilmerHale, 950 Page Mill Road, Palo Alto.